WD 5 Premium 13482350 https://www.kaercher.com/ae/home-garden/multi-functional-vacuum-cleaners/multi-purpose-vacuum-cleaners/wd-5-premium-13482350.html The WD 5 Premium is an extremely powerful and efficient multi-purpose vacuum cleaner with a 25-litre stainless steel container, a flat pleated filter in a removable filter box, filter cleaning etc. More than excellent: The top class WD 5 Premium! The multi-purpose vacuum cleaner is extremely powerful with a power consumption of only 1,100 watts. The multi-purpose vacuum cleaner is equipped with a corrosion-resistant 25-litre stainless steel container and innovative filter removal technology, which allows you to conveniently remove the flat pleated filter in seconds by folding out the filter box. The filter is also ideal for wet and dry vacuuming with no need for filter replacement. Thanks to integrated filter cleaning, the dirty filter can be efficiently cleaned at the push of a button with strong pulse air streams, so that suction power is quickly restored. 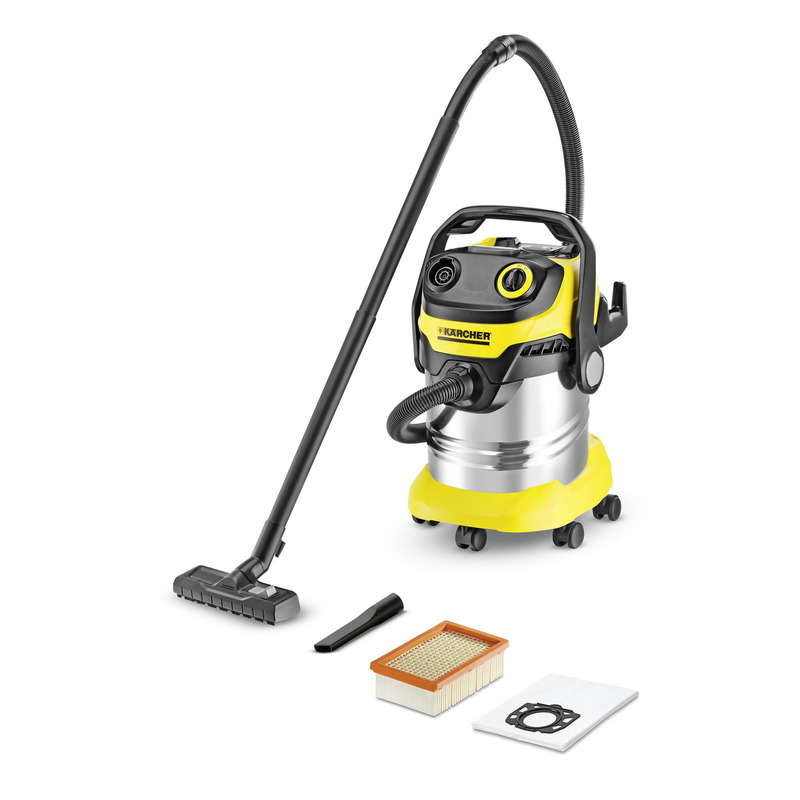 The switchable floor nozzle with two rubber and two brush strips and the optimised suction hose guarantee optimal pick-up of all types of dirt and offer maximum cleaning convenience. The handle with electrostatic protection (especially useful when vacuuming fine dust) is removable, and enables the attachment of accessories directly to the suction hose. Other convenient features, such as parking position, blower function, 3-in-1 carrying handle and cable and accessory storage, complete the device's profile. The container can be quickly and easily opened, closed and emptied.